Here we report the synthesis and characterization of ordered nanoporous carbon (with a 4.6 nm pore size) and SBA-15 (with a 5.3 nm pore size). The work describes the surface and textural properties of nanoporous molecular sieves, their wettability, and the melting behavior of D2O confined in the materials. Sterczyńska, A., Śliwińska-Bartkowiak, M., Zienkiewicz-Strzałka, M., Deryło-Marczewska, A. Surface Properties of Synthesized Nanoporous Carbon and Silica Matrices. J. Vis. Exp. (145), e58395, doi:10.3791/58395 (2019). In this work, we report the synthesis and characterization of ordered nanoporous carbon material (also called ordered mesoporous carbon material [OMC]) with a 4.6 nm pore size, and ordered silica porous matrix, SBA-15, with a 5.3 nm pore size. This work describes the surface properties of nanoporous molecular sieves, their wettability, and the melting behavior of D2O confined in the differently ordered porous materials with similar pore sizes. For this purpose, OMC and SBA-15 with highly ordered nanoporous structures are synthesized via impregnation of the silica matrix by applying a carbon precursor and by the sol-gel method, respectively. The porous structure of investigated systems is characterized by an N2 adsorption-desorption analysis at 77 K. To determine the electrochemical character of the surface of synthesized materials, potentiometric titration measurements are conducted; the obtained results for OMC shows a significant pHpzc shift toward the higher values of pH, relative to SBA-15. This suggests that investigated OMC has surface properties related to oxygen-based functional groups. To describe the surface properties of the materials, the contact angles of liquids penetrating the studied porous beds are also determined. The capillary rise method has confirmed the increased wettability of the silica walls relative to the carbon walls and an influence of the pore roughness on the fluid/wall interactions, which is much more pronounced for silica than for carbon mesopores. We have also studied the melting behavior of D2O confined in OMC and SBA-15 by applying the dielectric method. The results show that the depression of the melting temperature of D2O in the pores of OMC is about 15 K higher relative to the depression of the melting temperature in SBA-15 pores with a comparable 5 nm size. This is caused by the influence of adsorbate/adsorbent interactions of the studied matrices. In 1992, ordered nanoporous silica materials were obtained for the first time, using an organic template; since then, a large number of publications related to different aspects of these structures, synthetic methods, the investigation of their properties, their modifications, and different applications have appeared in the literature1,2,3. The interest in SBA-15 nanoporous silica matrix4 is due to their unique quality: a high surface area, wide pores with a uniform pore size distribution, and good chemical and mechanical properties. Nanoporous silica materials with cylindrical pores, such as SBA-155, are often used as a porous matrix for catalysts as they are efficient catalysts in organic reactions6,7. The material can be synthesized with a wide range of methods that can influence their characteristics8,9,10. Therefore, it is crucial to optimize these methods for potential applications in many fields: electrochemical devices, nanotechnology, biology and medicine, drug delivery systems, or in adhesion and tribology. In the present study, two different types of nanoporous structures are presented, namely silica and carbon porous matrices. To compare their properties, the SBA-15 matrix is synthesized using the sol-gel method, and the ordered nanoporous carbon material is prepared by the impregnation of the resulting silica matrix with a carbon precursor. Porous carbon materials are important in many appliances due to their high surface area and their unique and well-defined physicochemical properties6,11,12. Typical preparation results in materials with randomly distributed porosity and a disordered structure; there is also a limited possibility for the change of the general pore parameters, and thus, structures with relatively broad pore size distributions are obtained13. This possibility is broadened for nanoporous carbon materials with high surface areas and ordered systems of nanopores. More predicted geometry and more control of the physicochemical processes inside the pore space are important in many applications: as catalysts, separation media systems, advanced electronic materials, and nanoreactors in many scientific fields14,15. To obtain the porous carbon replicas, the ordered silicates can act as a solid matrix to which carbon precursors are directly introduced. The method can be divided into several stages: the selection of ordered silica material; the deposition of a carbon precursor in a silica matrix; carbonization; then, the removal of the silica matrix. Many different types of carbonaceous materials can be obtained by this method, but not all nonporous materials have an ordered structure. An important element of the process is the selection of a suitable matrix whose nanopores must form a stable, three-dimensional structure16. In this work, the influence of the type of pore walls on the surface properties of synthesized nanoporous matrices is investigated. The surface properties of OMC material are reflected by the surface properties of silica analog (SBA-15) of OMC. The textural and structural properties of both types of materials (OMC and SBA-15) are characterized by low-temperature N2 adsorption/desorption measurements (at 77 K), transmission electron microscopy (TEM), and energy dispersive X-ray analysis (EDX). Low-temperature gas adsorption/desorption measurement is one of the most important techniques during the characterization of porous materials. Nitrogen gas is used as an adsorbate due to its high purity and the possibility to create a strong interaction with solid adsorbents. Important advantages of this technique are the user-friendly commercial equipment and relatively easy data-processing procedures. The determination of nitrogen adsorption/desorption isotherms is based on the accumulation of the adsorbate molecules on the surface of solid adsorbent at 77 K in a wide range of pressure (P/P0). The Barrett, Joyner, and Halenda (BJH) procedure for calculating the pore size distribution from experimental adsorption or desorption isotherms is applied. The most important assumptions of the BJH method include a planar surface and an even distribution of the adsorbate on the investigated surface. However, this theory is based on the Kelvin equation and it remains the most widely used manner for calculating the pore size distribution in the mesoporous range. To evaluate the electrochemical character of the samples, a potentiometric titration method is applied. The surface chemistry of the material depends on the surface charge related to the presence of heteroatoms or functional groups on the surface. The surface properties are also investigated by contact angle analysis. The wettability inside the pores provides information about the adsorbate-adsorbent interactions. The influence of the wall roughness on the melting temperature of the water confined in both samples is studied with the dielectric relaxation spectroscopy (DRS) technique. Measurements of the dielectric constant allow the investigation of melting phenomena as the polarizability of the liquid and solid phases are different from each other. A change in the slope of the temperature dependence of the capacitance shows that melting occurs in the system. Prepare 360 mL of 1.6 M HCl by adding 50 mL of HCl (36% - 38%) in a 500 mL round-bottom flask and, then, adding 310 mL of ultrapure water (resistivity of 18.2 MΩ·cm). To that, add 10 g of PE 10500 polymer (6.500 g/mol). Place the flask in an ultrasonic bath. Heat the solution to 35 °C and stir it until the solid polymer is completely dissolved, making a homogeneous mixture. Add 10 g of 1,3,5-trimethylbenzene to the flask and stir the content (at a stirring rate of 220 rpm) by maintaining it at 35 °C in the water bath. After stirring for 30 min, add 34 g of tetraethyl orthosilicate (TEOS) to the flask. Add the TEOS slowly and dropwise with constant stirring. Ensure that it takes 10 min to add 34 g of TEOS. Stir the solution mixture again for 20 h at the same temperature (35 °C). Transfer the contents of the flask into a polytetrafluoroethylene cartridge and place it in an autoclave. Leave the solution for 24 h at 90 °C. Filter the resulting precipitate, using a Büchner funnel, and wash it with distilled water, using at least 1 L.
Dry the obtained solid at room temperature and apply a thermal treatment to the sample at 500 °C, using a muffle furnace in an air atmosphere for 6 h.
Prepare impregnation solutions (IS1 and IS2) with appropriate proportions of water, 3 M sulfuric acid (VI), and sugar (glucose), where glucose plays the role of carbon precursor and sulfuric acid acts as catalyst. CAUTION: Sulfuric acid is very toxic, it causes severe skin burns and eye damage. Prepare IS1. For each gram of silica, mix 5 g of water, 0.14 g of 3 M sulfuric acid (VI), and 1.25 g of sugar. Prepare IS2. For each gram of silica, mix 5 g of water, 0.08 g of 3 M sulfuric acid (VI), and 0.75 g of sugar. Place the silica material (1 g) and the prepared solution IS1 of the carbon precursor and the catalyst in a 500 mL flask. Heat the mixture in a vacuum dryer at 100 °C for 6 h.
NOTE: In this step, use only IS1. IS2 should be applied in the next step. Add the IS2 to the mixture in the vacuum dryer (to the solution with the partially carbonized carbon precursor). Heat the mixture again in the vacuum dryer at 160 °C for 12 h.
Transfer the obtained composite to a mortar for the fragmentation of the larger particles and a homogenization of the material. Place the obtained product into the flow furnace and heat it to 700 °C (at a heating rate of 2.5 °C/min) and heat for 6 h at this temperature. Heat the material in a nitrogen atmosphere. Allow the solution to cool before opening the furnace. Prepare 100 mL of etching solution (ES). Mix 50 mL of 95% ethyl alcohol and 50 mL of water. Add 7 g of potassium hydroxide and stir until it is dissolved. Place all obtained carbonized material (at least 1 g) in a 250 mL round-bottom flask and add 100 mL of ES. Supply the system with a reflux condenser and magnetic stirrer and heat to a boil while stirring constantly. Boil the mixture for 1 h.
Transfer the obtained material to the Büchner funnel, wash it with at least 4 L of distilled water, and dry it. Prepare 150 mL of 1.6 M HCl. Dissolve 4 g of PE 6400 polymer (EO13PO70EO13) in 150 mL of acid solution in a round-bottom flask. Place the flask in an ultrasonic bath. Heat the solution to 40 °C and stir it so that the polymer can dissolve (at least for 30 min). Slowly add 8.5 g of TEOS to the flask, dropwise, with constant stirring. Stir the solution mixture for 24 h at the same temperature (40 °C). Transfer the contents of the flask to a polytetrafluoroethylene cartridge. Leave the solution for 24 h in a 120 °C oven. Filter the resulting precipitate, using a Büchner funnel, and wash it with distilled water (at least 1 L). Dry the obtained solid at room temperature and calcine for 6 h at 600 ° C, using a muffle furnace in an air atmosphere. Use an automatic sorption analyzer to obtain N2 adsorption/desorption isotherms at 77 K.
Use an appropriate glass tube for nitrogen sorption measurements. Before adding the porous sample to the glass tube, clean the tube in an ultrasonic washer and rinse it first with distilled water and, next, with anhydrous ethanol. Heat the glass tube at 150 °C for 3 h and fill the tube with compressed nitrogen. Weigh the empty glass tube under the nitrogen conditions before the measurement to minimize the weight error. Place the sample in the glass tube and weigh the total mass (the mass of the sample with the glass tube). Prior to the measurements, degas the sample. Place the glass tube with the sample in the degassing port of the sorption analyzer. Apply the following process conditions: a pressure of at least 0.01 mmHg, a temperature of 423 K, and a duration of 24 h. In the degassing port, connect the sample to the vacuum and heat it to the set temperature (423 K). After degassing, fill the sample with nitrogen and transfer it to the analysis port. Use the TEM microscope with the 120 kV (for SBA-15) and 200 kV (for the OMC material) accelerating voltages to collect the good quality TEM images. For preparing a monodisperse film of the sample, disperse the sample (1 mg) in ethanol (1 mL). Perform the dispersion procedure in a microcentrifuge tube by placing it in an ultrasonic bath for 3 min. Place two drops of the dispersion on a TEM copper grid using a micropipette. Transfer the TEM grid to the TEM microscope and start the TEM imaging. Use a scanning electron microscope equipped with an X-ray detector to acquire an energy dispersive X-ray spectrum of the samples. Apply an acceleration voltage of 15 kV to harvest the spectrum. Select the silicon as the optimization element for SBA-15 and the carbon for the OMC sample. Use an automatic burette to perform the potentiometric titration experiment. Add the titrant in small and controlled portions (according to the titration software and procedure). Provide the smallest increment, at least 1 μL, by an automatic dosing intrument. Disperse 0.1 g of the sample in 30 mL of an electrolyte solution (water solution of 0.1 M NaCl). Use the magnetic stirrer and isothermal conditions (293 ± 0.1 K) during the dispersion procedure. Add 1 - 2 mL of titrant (0.1 M NaOH solution) to the suspension. NOTE: Perform the addition in small aliquots (each to be about 0.05 mL). The automatic burette The procedure should provide at least a dozen experimental points in the pH range from 1 to 14. Calculate the surface density of the charge Qs, using the following formula. F = the Faraday number. To determine the contact angle inside the pores of the studied samples, use the capillary rise method. NOTE: This method is based on the measurement of the mass rise of the liquid, which is penetrating the porous bed, as the function of the time. The main assumption of this method is based on the fact that penetrating liquid is advancing into the porous column and that this column consists of intergranular capillaries with a certain average radius. Thus, every relation derived for single capillary is valid for the layer of the porous powder. In a single vertical capillary, the wetting liquid floats against the gravitational forces as a result of the difference of pressure between the liquid and the vapor in the pores (capillary pressure). In this meaning, the penetration of the liquid into the porous bed allows the determination of the dynamic advancing contact angle inside the pores. Apply the modified Washburn’s equation17,18, expressed as follows. Using equation (2), estimate the values of the advancing contact angles inside the studied pores. Prepare the force tensiometer. For powders, use a glass tube with a diameter of 3 mm and a ceramic sinter; for liquid, use a vessel with a diameter of 22 mm and a maximum volume of 10 mL. Measure 0.017 g of the sample. Start the computer program connected to the tensiometer. Put a vessel with the liquid on a motor-driven stage and suspend the glass tube with the sample on an electronic balance. Start the motor and start approaching the liquid in the vessel with the sample at a low constant rate of 10 mm/min; set the immersion depth of the sample tube into the liquid equal to 1 mm. From this moment, the dependence m2 = f(t) registers in the computer program. Stop the experiment when the dependence m2 = f(t) starts to show the characteristic plateau. Check for accuracy by repeating this procedure 3x - 5x. To describe the melting behavior of confined water inside the studied porous matrices, perform the temperature measurements of electric capacitance C of the sample present in a parallel plate capacitor made of stainless steel19,20,21. To measure the capacitance C as the function of the temperature and the frequency of the applied cyclic electric field, use an impedance analyzer. NOTE: The complex electric permittivity is defined as ε* = ε` + iε``, where ε` = C/C0 is the real, and ε`` = tgδ·ε` is an imaginary part of the permittivity, where C0 is the capacitance of the empty capacitor and tgδ are the dielectric losses. Put the measured sample into the plate capacitor. Select a frequency range from 100 Hz to 1 MHz and a temperature from 140 K to 305 K. Control the rate of temperature change with the temperature controller; set the temperature rate as equal to 0.8 K/min during the cooling and 0.6 K/min during the heating process. To characterize the porous structure of the investigated samples of OMC and SBA-15, the N2 adsorption-desorption isotherms were recorded at 77 K. The experimental N2 gas adsorption-desorption isotherms characterizing the investigated systems, as well as the pore size distributions (PSD) obtained from the adsorption and desorption data, are presented in Figure 1A-D. The position of the inflection points on the sorption isotherms (Figure 1A, C) indicates the pressure at which the process of mesopore filling starts. This information is needed for the calculation of the mean pore size and the PSD (Figure 1B, D), according to the Kelvin equation. Figure 2A-C presents the TEM images of the OMC. Figure 2D, E presents the TEM images of the SBA-15 sample. The obtained TEM micrographs were used for evaluating the quality of the synthesized materials and confirming the two-dimensional hexagonal structure. An interpretation of the TEM images allows an estimation of the pore sizes and a comparison of the values with the data obtained from sorption measurements (Figure 1). Figure 3 shows the surface charge density distribution for carbon and silica material. The properties of surfaces and interfaces of supports and solid matrices have a crucial impact on the characteristics of investigated materials and on the physicochemical processes and phenomena on their surface or in their vicinity. An experimental investigation of the surface properties, such as surface charge densities, seems to be appropriate and valuable for investigating how surface properties (presence and types of functional groups) influence the investigated chemical and physical phenomena. In particular, the surface characteristics related to the surface chemistry of the carbon materials depend on the surface charge defined by heteroatoms (such as oxygen or nitrogen) and influence the wettability, adsorptive properties, electrochemical and catalytic features, and finally, acid-base and hydrophilic-hydrophobic behavior. An analysis of the point-of-zero charge position on the pH scale provides information about the system's acidity; the lower the pHpzc value, the more acidic the sample is. Figure 4A, B shows typical TEM-energy dispersive X-ray spectroscopy (EDS) spectra for the OMC sample illustrating the interaction of the incident electron beam with the sample, which generates the X-rays with energies characteristic of an atomic number of elements. TEM-EDS is a powerful tool for the determination of the chemical composition. Figure 4C shows the EDS results for SBA-15 material. The value of the energy of the characteristic radiation coming from the sample allows an identification of the elements contained in the studied sample, while the intensity (the height of the peaks in the spectrum) enables a qualitative analysis of its contents (Figure 4C). Figure 5 depicts the results of the measurements of contact angles inside the nanopores of OMC (Figure 5A) and SBA-15 (Figure 5B), referenced to the wettabilities on smooth highly oriented pyrolytic graphite (HOPG) and glass substrates, respectively. An ideally smooth silica surface glass and HOPG graphite as a smooth graphite surface were used. The measured contact angles are shown as a function of the microscopic wetting parameter αw for both the smooth planar silica, the graphite surface, and the rough nanoporous materials. Values of αw for the liquids on these silica and graphite substrates (Figure 5A, B) can be found based on the following equation. Δ = the distance between the separating layers in the substrate. These values are taken from previously published literature22,23,24. The measurement of wettability allows the characterization of the adsorbate/adsorbent interactions. Together with the potentiometric titration and EDX analysis, the measurement of wettability provides a full description of the surface properties of a given sample. The lower the contact angle, the higher the wettability, which means that the interaction of the penetrating liquid molecule with the studied surface is stronger (Figure 5A, B). f = is the fraction of the porous surface which is in direct contact with the liquid interface. It is worth evaluating the roughness fractions f (equation 4) which acts as a correction factor for interpreting contact angle measurements for the liquid molecules with the sample surface in the pores. 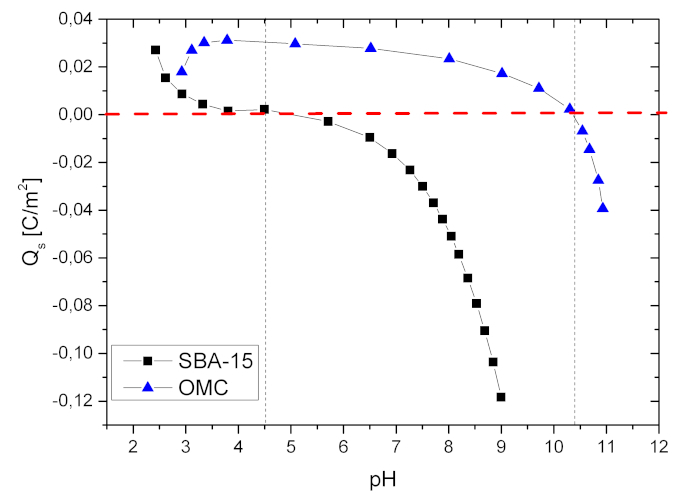 Figure 7 presents the dielectric spectroscopy results for deuterated water confined in the studied samples of OMC (Figure 7A) and SBA-15 (Figure 7B). These illustrate the temperature dependences of electric capacity C for both samples (Figure 7A, B). In the solid state of the polar substance, their orientational polarization vanishes, and the dielectric constant ε is equal to n2, where n is the refractive index of the substance. The sharp increase visible in the C-T curves indicates the melting phase transitions occurring in the system. The temperature of the anomalous increase of the C-T function allows the determination of the melting point of both the bulk liquid and the melting point in the pores of the studied sample. 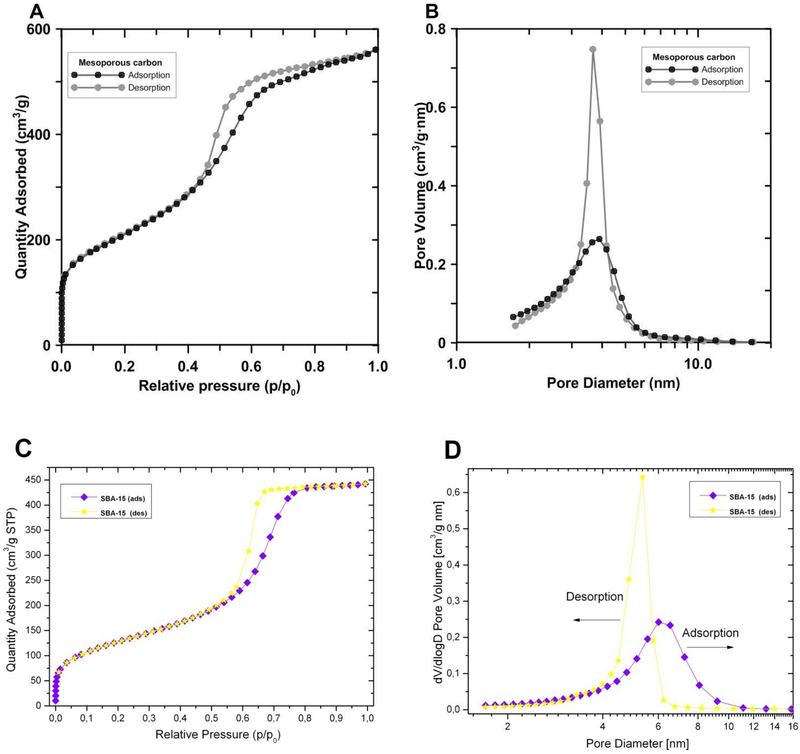 Figure 1: Experimental N2 adsorption/desorption isotherm plot at 77 K and porosity distributions by the Barrett, Joyner, and Halenda method (BJH)7,26,27. For (A and B) nanoporous carbon material and (C and D) silica SBA-15 material. The nitrogen isotherms show characteristic hysteresis loops, providing an information about the shape and pore size distributions of the studied pores. Please click here to view a larger version of this figure. 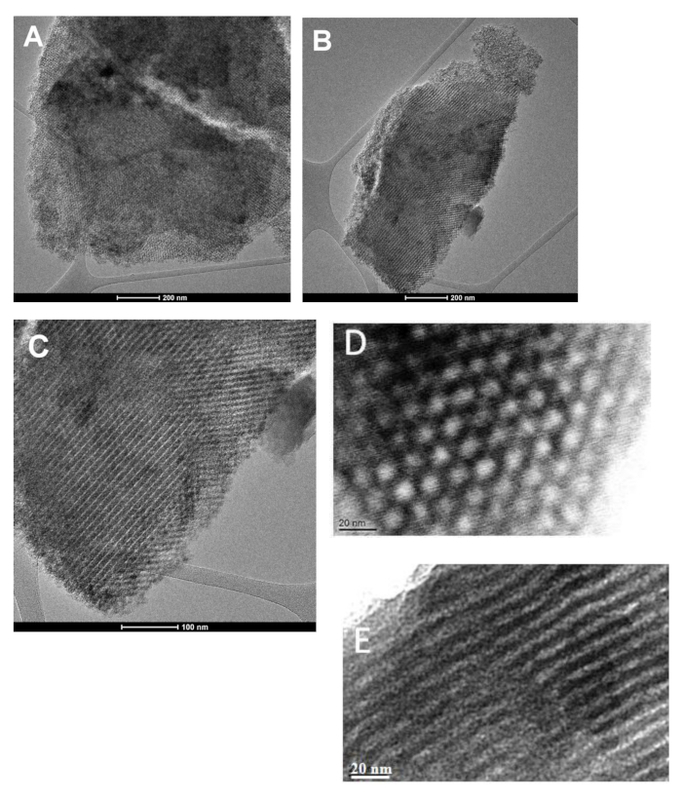 Figure 2: TEM images illustrating the ordered nanoporous channels structure. (A - C) TEM images of the nanoporous carbon along the (001) direction at various magnifications. (D - E) The structure of SBA-15. Please click here to view a larger version of this figure. Figure 3: Potentiometric titration results for OMC and SBA-15 (pH dependence of the surface charge density). The surface charge density dependence of pH shows the differences in the electrochemical character of both materials; the pzc point provides information about the number of acid sites on the sample surface. Please click here to view a larger version of this figure. Figure 4: Examples of TEM- EDS spectra and EDS analysis. (A and B) EDS spectra for the OMC sample, recorded from two different areas marked on the TEM image. (C) EDS spectra and quantitative analysis result of the SBA-15 sample. Quantitative results of an EDS analysis give information about the presence of elements in the functional groups responsible for the surface reactivity; this is a technique complementary to the potentiometric titration. Please click here to view a larger version of this figure. Figure 5: Contact angles vs. the microscopic wetting parameter measured inside the porous matrices. 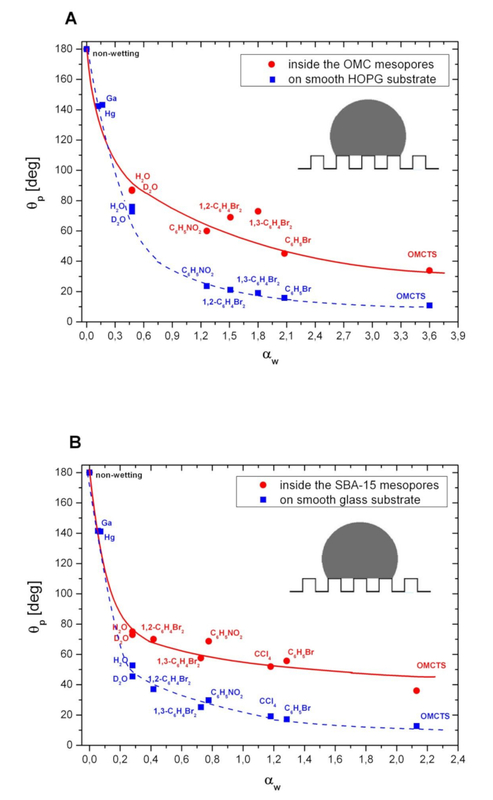 (A) The nanoporous carbon (OMC) and (B) silica (SBA-15) matrix, referenced to as the contact angles vs. the microscopic wetting parameter function on smooth HOPG and glass substrates, respectively. The wettability inside the pores refers to the wettability on flat surfaces and provides some information about the influence of the pore roughness on adsorbate/adsorbent interactions. Please click here to view a larger version of this figure. Figure 6: The roughness fractions f calculated from the Cassie-Baxter model vs. the microscopic wetting parameter. For (A) the nanoporous carbon (OMC) and (B) silica (SBA-15) matrix. An application of the Cassie-Baxter model of wettability allows the interpretation of contact angles on rough porous substrates. The f fractions calculated from this model describe the percentage of contributions of the porous wall which are in direct contact with the liquid surface. Please click here to view a larger version of this figure. Figure 7: Temperature dependences of electric capacitance of D2O water confined inside the OMC and SBA-15 porous matrix. The (A) OMC and the (B) SBA-15 porous matrix. The interpretation of the C-T function allows the identification of the temperature of the phase transition of D2O in pores and in the bulk occurring in the studied system. An increase in C-T function lead to the increase in melting point for both bulk water and confined water inside the pores. The value of the melting point's shift in pores relative to the bulk is dependent on the host/guest molecular interactions. Please click here to view a larger version of this figure. 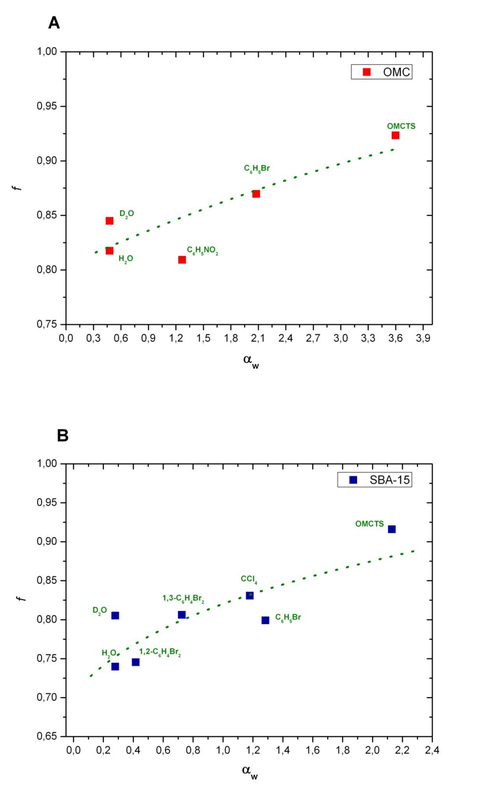 Table 1: The values of textural parameters describing a porous structure of ordered nanoporous carbon and SBA-15 silica calculated from N2 sorption isotherms. aBET surface area calculated using experimental points at the relative pressure of (P/P0) 0.035 - 0.31, where P and P0 are denoted as the equilibrium and saturation pressure of nitrogen. bSurface area and pore volume of micropores calculated by the t-plot method with a fitted statistical thickness in the range from 3.56 to 4.86 Å. cTotal pore volume calculated by 0,0015468 x the amount of nitrogen adsorbed at P/P0 = 0.99. dHydraulic pore diameters calculated from the BET surface areas and pore volumes according to the equation: Dh = 4V/S. eThe pore diameter estimated from the PSD maximum of the nonlocal density functional theory (NLDFT). NLDFT calculations were performed using a nonnegative regularization of 0.001 and the cylindrical geometry of pores as a model of carbon porosity. fThe pore diameter estimated from the BJH method (the same results for adsorption and desorption data). *The lack of values of pore diameters of SBA-15 estimated from the NLDFT method. The critical steps during the preparation of the ordered mesoporous carbon material include the preparation of the ordered mesoporous silica materials as the template with well-defined structural properties that affect the properties of the final materials and a tempering/carbonization step under a nitrogen atmosphere. The modification of the typical method of preparation of the mesoporous ordered silicates with cylindrical pores28 concerns the application of an untypical structure-directing agent that is PE10500 polymer, for the improvement of the structural properties of the material. The three-dimensional, interconnected, and stable porous structure of the template is necessary for the preparation of the mesoporous carbon materials. Moreover, a key disadvantage of the preparation is the essential requirement of the sample treatment for the template removal. The properties of chemicals used in this step can affect the carbon surface and its functionality. According to the presented strategy, the preparation of the negative replication of OMC is based on the ordered mesoporous solid template. The pore size control and symmetric ordering are simply determined using the silica template and are not associated with the interaction between the carbon precursor and the template. The potential of OMC for various electrochemical systems has been indicated in the literature29,30. The impregnation mechanism presented in this work is responsible for the facile process to precisely replicate the negative structure of the silica template. The nature of the hard template procedure ensures that the pyrolysis phenomena cause less damage to the regular and ordered structure. Moreover, this method allows an easier graphitization of the OMC materials formed within the solid template. The experimental N2 adsorption/desorption isotherm (Figure 1A, C) was used to obtain preliminary information about the type and size of porosity. The nanoporous character of the material was clearly confirmed. A small increase in the quantity of nitrogen adsorbed in the initial stage of the process (in the range of relative pressure below 0.03) and its significant increase in the further range of relative pressure (especially in the range of mesopores) indicates the existence of a significant number of mesopores and the lack, or a very small number, of micropores. The adsorption-desorption isotherms obtained for this material are typical of type-IV (IUPAC classification31), which is a correct reflection of the carbon mesoporous channel system with a sharp capillary condensation stage at intermediate relative pressure (0.45 - 0.9 P/P0). The position of the capillary condensation step corresponds to the primary size of mesopores (about 4 - 5 nm). The investigated carbon sample exhibits also a high specific surface area (757 m2·g-1) and a significant pore volume (0.87 cm3·g-1). The critical steps during nitrogen adsorption/desorption measurements are the very precise mass sample determination step and the sufficiently degas step. The measurement procedure was performed according to the appropriate guidelines. Despite the fact that the determination of the surface area and the pore size distribution is based on the physisorption measurements, the interpretation of the experimental isotherms is not always direct. During the computation of the mesopores' size distribution, by application of the modified Kelvin equation (which is the basis of the theory), it is necessary to accept the assumption of the rigid pores of well-defined shape. Moreover, the range of validity of the Kelvin equation and the interpretation of hysteresis loops on the isotherms remain unresolved problems. The possibility of facilitation is related to the application of empirical methods of isotherm analysis (e.g.,the αs-method29,30,31,32,33,34). However, this manner requires the use of adsorption data obtained with nonporous reference materials. Figure 1B, D presents the mesopores' size distributions of studied samples (PSD). The assumption of the BJH theory permitted the determination of the mesopores' size distribution. The PSD curve presented in Figure 1B suggests that the carbon sample contained mesopores of the sizes of 3.5 - 4 nm, whereas SBA-15 possessed pores with a diameter of about 5 nm (see Figure 1D). Interestingly, for the OMC sample, the maxima of the pore size distribution curves calculated from adsorption and desorption data are very similar. Such as accurate agreement between the results, in view of different mechanisms of adsorption and desorption phenomena, evidence a very ordered and uniform nature of the material. The textural properties determined from experimental isotherms are summarized in Table 1. The properties of the pore network structure based on the physical adsorption/desorption analyses are fundamental to the characterization of nanopowders and nanomaterials. Nitrogen adsorption/desorption methods can be regarded as the first stage in the characterization of microporous and mesoporous solids. The method is, in general, applicable to samples of all classes of porous bodies or materials and allows an estimation of the porous structures on the basis of the shapes of isotherms and hysteresis loops directly from the experimental measurement. The nitrogen adsorption/desorption next to the other methods of porous structure determination (liquid intrusion35 and light, X-ray, and neutron scattering36,37 and microscopy32) is the most important and useful technique due to the wide applicability and mutual comparability of the results. Nitrogen is a standard adsorptive gas molecule for pore characterization by gas adsorption method. It is possible to use other types of molecules (carbon dioxide, krypton, argon) for obtaining new information about the sample and for the characterization of microporous materials. The TEM micrographs of investigated OMC and SBA-15 samples are presented in Figure 2. They confirmed a highly ordered system of mesopores, comprising of parallel and very similar porous channels and a carbon rod-shaped structure with the pore size ~11 nm (Figure 2A-C). TEM micrographs of OMC confirmed a hexagonal symmetry of the pores as a result of the inverse replica of the initial nanoporous silica precursor and a pore diameter between the rods of 4.0 nm. The SBA-15 sample shows the two-dimensional ordered hexagonal structure of the mesopores; the well-ordered structure of SBA-15 is observed in both projections, along with the nanoporous channels and perpendicular to them (Figure 2D, E). These observations are in good agreement with the values obtained from the experimental nitrogen sorption data (see Table 1). Transmission electron microscopy is able to provide images at a higher resolution than light microscopy due to the smaller de Broglie wavelength of the electrons. This enables us to capture the details thousands of times smaller than a resolvable object seen in a light microscopy. In this method, the image comes from the interaction of the electrons with the sample when the beam is transmitted throughout the specimen. Therefore, one of the limitations of the method is that the specimen should be an ultrathin film of less than 100 nm thick or a suspension applied on a grid. TEM can be improved on by a scanning transmission electron microscope (STEM). It should be possible by an addition of a system combined with suitable detectors, which will raster the beam across the sample to form the image. The pH of the point-of-zero charge of OMC (i.e., the pH value below which the total surface of the carbon particles is positively charged) was found to be above pH = 10 (Figure 3). For comparison, the pH of the point-of-zero charge of the SBA-15 material is equal to about 4.5. Potentiometric titration results of SBA-15 material show a shift of pHpzc toward lower pH values, evidencing of the existence of some acid centers on the SBA-15 surface. The negatively charged sites increase the Van der Waals interactions between the adsorbent/adsorbate molecules in the SBA-15 matrix, improving the adsorptive properties of the silica matrix. The critical steps during potentiometric titration measurement include the very precise addition of the titrant to the suspension and continuity of stirring. The potentiometric titration procedure was fully automated to ensure the most reliable results. Another important and unique step was the application of special software for controlling experimental conditions and calculations. The limitation of this method is the calibration step of the pH electrode and the need to ensure a stable atmosphere (for example, nitrogen) and temperature. Potentiometric titration can be categorized as an acid/base titration procedure. This technique requires measurements of the voltage change upon titrant addition steps. It provides an adaptable, affordable, and highly accurate technique to achieve high purity, which is essential in many fields, particularly in pharmaceuticals and functional material studies. In fact, there are a number of types of potentiometric titrations. There are, for instance, acid-base, redox, precipitation, and complexometric techniques. As potentiometric titrations can be realized automatically, it ensures greater capacity for sample characterization. The pzc is determined as the intersection of the electrolyte titration curve and the titration curve recorded for carbon material, as well as the intersection of the surface charge density curve with the axis. The result suggests that investigated, ordered nanoporous carbon material has basic properties related to the presence of oxygen functional groups (-OH terminal groups of ketonic, pyronic ring, chromenic, and π-electron systems)38,39,40,41. The basic properties of the carbon surface can be a result of a thermal treatment that causes progressive destruction and removal of acidic oxygen functional groups (for example, carboxyls, lactones, and phenols) and, thus, enriches the carbon surface in basic functional groups42. The presence of these basic sites is a consequence of the simultaneous decrease in the number of acidic sites and a reduction of oxygen content associated directly with the acidity. The content of oxygen was verified by the TEM-EDS. TEM-EDS spectra images of the OMC surface from two different areas of the sample are displayed in Figure 4A, B. Oxygen and silicon atoms from the OMC surface were detected despite the predominant amount of carbon. The atomic and weight percentage of the elements, presented as insets and obtained from different areas of the samples, are similar and indicate about 98% is composed of carbon and only slightly more than 1% of the composition is attributable to oxygen. EDS microanalysis may suggest that the basic character of the OMC surface is associated with very low number of oxygen-containing functional groups, which typically has acidic functionality. Moreover, the basic functional groups can be responsible for the growing of hydrophilicity of the carbon materials. An EDS spectrum of silica matrix confirms the main contribution of oxygen and silicon abundance in the SBA-15 (Figure 4C). EDX is one of the techniques that determine the atomic composition of the specimen. It does not give chemical information (e.g., oxidation state, chemical bonds), like an XPS method. For quantitative analysis, EDX is not suitable for light elements (e.g.,like oxygen) since it can only detect the presence of oxygen but cannot quantitate it. This method works only on the surface of thin layers (of a few microns or less) and is quite sensitive to the contamination in the specimen. In Figure 5 A, B the results of contact angle measurements for several liquids on silica and carbon substrates are presented; we can see that the systems reveal a wide range of wettabilities. Two of the applied substrates are smooth and planar, namely the silica and carbon surfaces, while the others show roughness and contain mesopores. The measured contact angles are presented vs.the microscopic wetting parameter, αw. This parameter is the ratio between the liquid-pore wall intermolecular interactions to the interactions of two liquid molecules22,23,24. Therefore, it measures the wetting properties at the nano- and macroscales. The αw parameter is shown to be a monotonic function of the contact angle. According to the measurements, the values of contact angles for the surfaces with roughnessare higher than those for the smooth planar surfaces, irrespective of the type of studied liquids, including nonwetting andwell-wetting liquids. These results suggest the Cassie-Baxter mechanism of wettability on nanorough surfaces of porous walls. Moreover, the contact angles measured for several liquids inside silica and carbon nanopores indicate better wettability of the silica walls than the carbon walls, and the influence of pore roughness on the fluid/wall interactions is more pronounced for silica than for carbon nanopores. The capillary rise method is used to determine the contact angles and wettability of small particles in the powders. For a flat solid substrate, many techniques, such as sessile drop method and Wilhelmy plate method, can be applied to contact angle measurements. The use of capillary rise method assumes the satisfaction of four conditions during the process (i.e., Washburn's equation is derived based on these four assumptions): (1) a constant laminar flow, (2) the absence of an external pressure, (3) negligible gravitational force, and (4) the liquid at the solid-liquid interface does not move. The hydrostatic pressure is much smaller than the capillary pressure; therefore, the capillary pressure causes the liquid to rise upward along the tube. The wettability studies of small particles should always take into account the accuracy and reproducibility of the results. Tomeasure accurately the contact angle of small particles, the pressure increments and the hydrostatic effects should be taken into account in Washburn's equation to more accurately describe the relationship between the pressure increment and time. In Figure 6A, B, we present the fraction f (describing the part of a porous surface which is in direct contact with the liquid interface), defined as f = (1 + cosθp) / (1 + cosθ). It takes values from the range of 0.73 (H2O) to 0.92 (OMCTS) for silica matrix and from the range of 0.82 (H2O) to 0.93 (OMCTS) for carbon matrix. Moreover, the fraction f increases monotonically with the increasing αw parameter, which confirms the Cassie-Baxter model of wetting on rough substrates. These results, discussed within the framework of the Cassie-Baxter model, show that for nanosurfaces, the influence of microroughness significantly affects changes in the fluid-wall interactions. To investigate the influence of the character of the porous surfaces on the confinement effects of D2O in SBA-15 and OMC matrices with a comparable pore size of 5 nm, the dielectric method was used. The results of the electric capacity of water placed in OMC and SBA-15 upon heating, as presented in Figure 7A and Figure 7B, respectively, indicate that the temperature dependence of capacitance C shows a sharp increase at T = 260 K, corresponding to the melting of adsorbed D2O inside the pores of SBA-15, and at T = 246.1 K, which refers to the melting of water adsorbed inside the pores of OMC. For both systems, we observe an increase in the C(T) function at T = 276.5 K, which is referred to the melting point of the bulk deuterated water. The observed signals are related to both the bulk and the confined liquid because the samples are studied as suspension in filled porous matrices with the liquid being in excess. 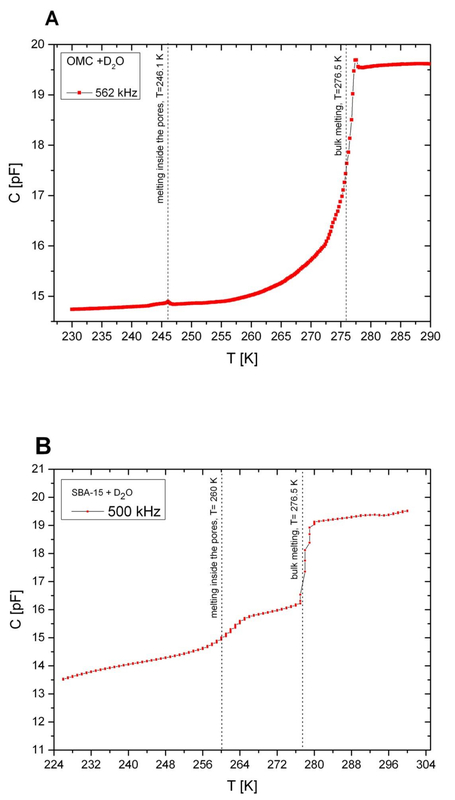 Relative to that of the bulk, the melting temperature of D2O in SBA-15 pores is depressed by ΔT = Tm,pore− Tm,bulk =-16.5 K, while for OMC, ΔT = -30.4 K.
These results come from various structures of the pore wall. The melting temperature in the pores Tm,pore is dependent on two variables, namely the pore size H and the wettability parameter αw. For smaller αw values (αw < 1), the depression of Tm,pore is expected. If the pore width H is the same, then the change in the αw value of the system affects the change in Tm,pore. The results of the wettability in pores show that the αw value in both systems studied decreases due to the roughness effects relative to those of the smooth surface. The work of immersed wettability in pores We = γlcosθp is much less for D2O in OMC (We = 4,2432 [mN/m]) than in SBA-15 (We = 20,968 [mN/m]), which leads to a high depression of the melting point in this system, relative to that for D2O in the SBA-15 system. The obtained results indicate an improvement in the adhesion effects on the porous silica wall, relative to those on the carbon wall. This method has some limitations when applied to the studied samples. One of them comes from the fact that the record of the C(T) function contains the signal from both the bulk liquid and the liquid confined in the pores. Therefore, the signal from the confined nonpolar liquid is weak, and it is difficult to determine the melting temperature. In the future, it is worth combining some additional methods along with it. (e.g., differential scanning calorimetry on a slow heating rate or centrifuging the sample to get concentrated sample without any liquid). Moreover, for the conductive samples, there is a need to use a polytetrafluoroethylene plate. An advantage of dielectric spectroscopy method is the fact that the method is used a lot, in many areas of research, such as glass transitions and time-scale molecular motions, where the time length is in the tens of femtoseconds to nanoseconds. Therefore, it is important to provide frequencies ranging from megahertz to terahertz. In cases such as decomposition of the obtained spectra or the interpretation and quantitative analysis of the results, the technique resembles more common spectroscopies. However, the dielectric method investigates the collective fluctuations of molecules with a permanent dipole moment (polar liquids). For example, infrared spectroscopy provides additional complementary information, although the sensitivity in the direction of collective modes may impede the interpretation of dielectric spectra. The authors would like to thank the National Center of Science for providing financial support with grant no. DEC-2013/09/B/ST4/03711 and UMO-2016/22/ST4/00092. The authors are also grateful for the partial support from the Poland Operational Program Human Capital PO KL 4.1.1, as well as from the National Centre for Research and Development, under research grant no. PBS1/A9/13/2012. The authors are especially grateful for Prof. L. Hołysz from Interfacial Phenomena Division, Faculty of Chemistry, Maria Curie-Skłodowska University, Lublin, Poland, for her kindness and enabling the measurements of the wettability in the SBA-15 nanopores. 1,3,5-trimethylbenzene Sigma-Aldrich, Poland M7200 Sigma-Aldrich Mesitylene, also known as 1,3,5-trimethylbenzene, reagent grade, assay: 98%. ASAP 2020. Accelerated Surface Area and Porosimetry System Micromeritics Instrument Corporation, Norcross, GA, USA Samples were outgassed before analysis at 120 oC for 24 hours in degas port of analyzer. The dead space volume was measured for calibration on experimental measurement using helium as a adsorbate. Automatic burette Dosimat 665 Metrohm, Switzerland The surface charge properties were experimentally determined by potentiometric titration of the suspension at constant temperature 20°C maintained by the thermostatic device. Prior to potentiometric titration measurements, the solid samples were dried by 24 hours at 120 oC. The initial pH was established by addition of 0.3 cm3 of 0.2 mol/L HCl. T The 0.1 mol/L NaOH solution was used as a titrant, added gradually by using automatic burette. Tecnai G2 T20 X-TWIN FEI, USA Transmission Electron Microscope with EDX detector. Tao, Y., Kanoh, H., Abrams, L., Kaneko, K. Mesopore-Modified Zeolites: Preparation, Characterization, and Applications. Chemical Reviews. 896-910 (2006). Wan, Y., Zhao, D. On the Controllable Soft-Templating Approach to Mesoporous Silicates. Chemical Reviews. 107, 2821-2860 (2007). Khder, A. E. S., Hassan, H. M. A., El-Shall, M. S. Acid catalyzed organic transformations by heteropolytungstophosphoric acid supported on MCM-41. Applied Catalysis A. 411, 77-86 (2012). Zhao, D. D., et al. Triblock Copolymer Syntheses of Mesoporous Silica with Periodic 50 to 300 Angstrom Pores. Science. 279, 548-552 (1998). Linssen, T., Cassiers, K., Cool, P., Vansant, E. Mesoporous templated silicates: an overview of their synthesis, catalytic activation and evaluation of the stability. Advances in Colloid and Interface Science. 103, 121-147 (2003). Eftekhari, A., Fan, Z. Ordered mesoporous carbon and its applications for electrochemical energy storage and conversion. Materials Chemistry Frontiers. 1, 1001-1027 (2017). Sing, K. Characterization of porous materials: past, present and future. Colloids and Surfaces A. 241, 3-7 (2004). Huo, Q., Margolese, D. I. Generalized synthesis of periodic surfactant/inorganic composite materials. Nature. 368, 317-321 (1994). Selvaraj, M., Kawi, S., Park, D. W., Ha, C. S. Synthesis and characterization of GaSBA-15: Effect of synthesis parameters and hydrothermal stability. Microporous and Mesoporous Materials. 586-595 (2009). Leonard, A., et al. Toward a better control of internal structure and external morphology of mesoporous silicas synthesized using a nonionic surfactant. Langmuir. 19, 5484-5490 (2003). Liang, C., Li, Z., Dai, S. Mesoporous Carbon Materials: Synthesis and Modification. Angewandte Chemie International Edition. 47, 3696-3717 (2008). Babić, B., et al. New mesoporous carbon materials synthesized by a templating procedure. Ceramics International. 39, (4), 4035-4043 (2013). Allen, S. J., Whitten, L., Mckay, G. The Production and Characterization of Activated Carbons: A Review. Developments in Chemical Engineering and Mineral Processing. 6, 231-261 (1998). Kwak, G., et al. Preparation Method of Co3O4 Nanoparticles Using Ordered Mesoporous Carbons as a Template and Their Application for Fischer-Tropsch Synthesis. The Journal of Physical Chemistry C. 117, (4), 1773-1779 (2013). Koo, H. M., et al. Effect of the ordered meso-macroporous structure of Co/SiO2 on the enhanced activity of hydrogenation of CO to hydrocarbons. Catalysis Science and Technology. 6, 4221-4231 (2016). Jun, S., Joo, S. H., Ryoo, R., Kruk, M., Jaroniec, M. Synthesis of New, Nanoporous Carbon with Hexagonally Ordered Mesostructure. Journal of the American Chemical Society. 122, (43), 10712-10713 (2000). Washburn, E. W. The dynamics of capillary flow. Physical Review Series2. 17, 273 (1921). Śliwińska-Bartkowiak, M., Sterczyńska, A., Long, Y., Gubbins, K. E. Influence of Microroughness on the Wetting Properties of Nano-Porous Silica Matrices. Molecular Physics. 112, 2365-2371 (2014). Śliwińska-Bartkowiak, M., et al. Melting/freezing behavior of a fluid confined in porous glasses and MCM-41: dielectric spectroscopy and molecular simulation. Journal of Chemical Physics. 114, 950-962 (2001). 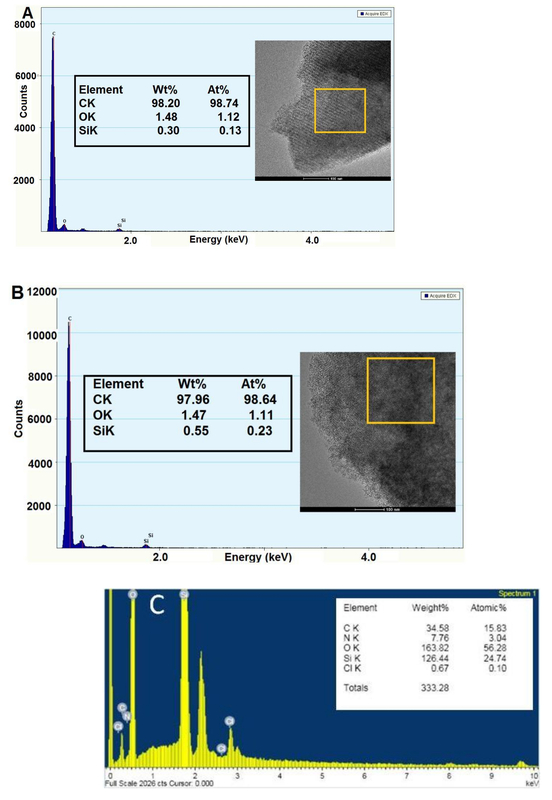 Coasne, B., Czwartos, J., Śliwińska-Bartkowiak, M., Gubbins, K. E. Freezing of mixtures confined in silica nanopores: experiment and molecular simulation. Journal of Chemical Physics. 133, 084701-084709 (2010). Chełkowski, A. Dielectric Physics. PWN-Elsevier. Warsaw, Poland. (1990). Radhakrishnan, R., Gubbins, K. E., Śliwińska-Bartkowiak, M. Global phase diagrams for freezing in porous media. Journal of Chemical Physics. 116, 1147-1155 (2002). Gubbins, K. E., Long, Y., Śliwińska-Bartkowiak, M. Thermodynamics of confined nano-phases. Journal of Chemical Thermodynamics. 74, 169-183 (2014). Radhakrishnan, R., Gubbins, K. E., Śliwińska-Bartkowiak, M. Effect of the fluid-wall interaction on freezing of confined fluids: Toward the development of a global phase diagram. Journal of Chemical Physics. 112, 11048 (2000). Cassie, A. B. D., Baxter, S. Wettability of porous surfaces. Transactions of the Faraday Society. 40, 546 (1944). Sing, K. Adsorption methods for the characterization of porous materials. Advances in Colloid and Interface Science. 76, 3-11 (1998). Sing, K. The use of nitrogen adsorption for the characterisation of porous materials. Colloids and Surfaces A. 187, 3-9 (2001). Yu, C., Fan, J., Tian, B., Zhao, D. Morphology Development of Mesoporous Materials: a Colloidal Phase Separation Mechanism. Chemistry of Materials. 16, (5), 889-898 (2004). Liu, D., et al. Enhancement of Electrochemical Hydrogen Insertion in N-Doped Highly Ordered Mesoporous Carbon. The Journal of Physical Chemistry C. 118, (5), 2370-2374 (2014). Choi, W. C., et al. Platinum Nanoclusters Studded in the Microporous Nanowalls of Ordered Mesoporous Carbon. Advanced Materials. 17, 446-451 (2005). Rouquerol, F., Rouquerol, J., Sing, K. Adsorption by Powders and Porous Solids: Principles, Methodology and Application. Academic Press. London, UK. (1999). Gregg, S. J., Sing, K. S. W. Adsorption, Surface Area and Porosity. Academic Press. London, UK. (1982). Llewellyn, P. L., Rouquerol, F., Rouquerol, J., Sing, K. S. W. Critical appraisal of the use of nitrogen adsorption for the characterization of porous carbons. Characterization of Porous Solids V. Unger, K. K., Kreysa, G., Baselt, J. P. Elsevier. Amsterdam, The Netherlands. Studies in Surface Science and Catalysis Vol. 128 421-427 (2000). Sing, K. S. W. The use of gas adsorption for the characterization of porous solids. Colloids and Surfaces. 38, 113-124 (1989). Rouquerol, J. Recommendations for the characterization of porous solids. Pure & Applied Chemistry. 66, 1739-1758 (1994). Marega, C. A direct SAXS approach for the determination of specific surface area of clay in polymer-layered silicate nanocomposites. The Journal of Physical Chemistry B. 116, 7596-7602 (2012). Tsao, C. S., et al. Neutron Scattering Methodology for Absolute Measurement of Room-Temperature Hydrogen Storage Capacity and Evidence for Spillover Effect in a Pt-Doped Activated Carbon. The Journal of Physical Chemistry Letters. 1, 1569-1573 (2010). Mattson, J. S., Mark, H. B. Activated Carbon: Surface Chemistry and Adsorption from Solution. Dekker. New York, NY. (1971). László, K., Szucs, A. Surface characterization of polyethyleneterephthalate (PET) based activated carbon and the effect of pH on its adsorption capacity from aqueous phenol and 2,3,4-trichlorophenol solutions. Carbon. 39, 1945-1953 (2001). Garten, V. A., Weiss, D. E., Willis, J. B. A new interpretation of the acidic and basic structures in carbons. Australian Journal of Chemistry. 10, 309-328 (1957). Boehm, H. P. Surface oxides on carbon and their analysis: A critical assessment. Carbon. 40, 145-149 (2002). Menendez, J. A., Phillips, J., Xia, B., Radovic, L. R. On the modification and characterization of chemical surface properties of activated carbon: In the search of carbons with stable basic properties. Langmuir. 12, 4404-4410 (1996).